Skincare is one of my all-time favorite and most hated subjects. Experimenting with new products is always a buzz but when the end result is bad, it doesn’t feel the best. Then there are more products and steps to be followed in order to get rid of the undesirable results. But you must be with me on this? Sometimes it’s just so fun to try out new things when it comes to the world of skincare yet, at the same time, it can just feel so tiresome and exhausting. Especially when Rosacea is added into the fun and gleeful world of skincare. Rosacea is the worst nightmare of a skincare enthusiast. It is a skin reddening condition. Well, that’s the way I’ve chosen to think of it. For years I let the idea of flushing and red patches get me down, but no more. I’ve taken to it in a whole new light. A natural blush and warm go is what I focus on for now, but that doesn’t mean I don’t want to try things out to try and calm it down. Sometimes it’s okay to feel about skin with the condition of Rosacea, so maybe that is most of the time these days, but I do have my off days as we all do. Some days, we just want it to go away. I guess this is more than true on days when it gets worse. Sufferers will know that Rosacea can flare up bad when it’s triggered. For me sunlight, stress and exhaustion can do it, but I have heard that exercise, hot drinks and spicy food can do it too. So, on days when it’s feeling that little bit worse, I like to have my own kind of arsenal to try and calm it down a little. I’ve tried cream and antibiotics over the years, but I always like to try the latest beauty whizzes too. So, it just made sense to give Skinception Rosacea Relief Serum a go. 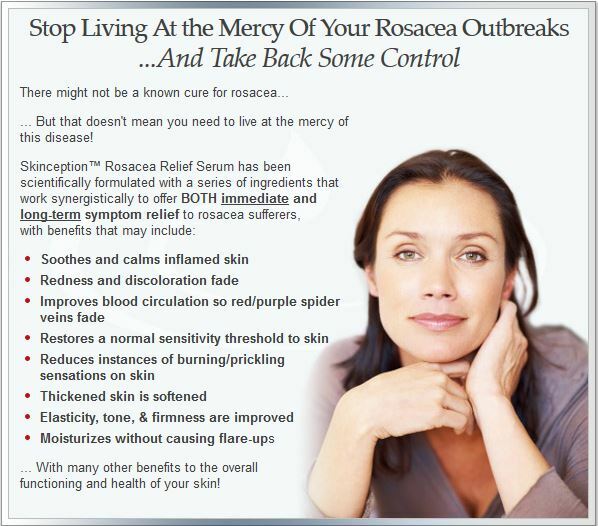 It is commonly known by now but you may or may not know that there isn’t a cure for Rosacea. It can feel frustrating at times, but it’s also a handy thing to know so that you can just accept it and get on with your life. There’s nothing worse than wishing and hoping for change, when it just can’t happen. Skinception are leaders in the skincare field when it comes to certain products and I’d definitely say that their Rosacea Relief Serum is one of them. It’s been designed to soothe the red skin that goes hand in hand with Rosacea as well as any heat that suffers experience too. The Skinception Rosacea Relief Serum claim to soothe the skin and reduce any heat, but also slow down any premature ageing. This might sounds strange, but inflamed skin is a huge speeding process for ageing – so it is good to know that the Skinception aims to combat that. Like I said, Rosacea can come in waves, especially when it’s been triggered. This Relief Serum is designed for those bad patches. To take away redness and reduce inflammation, help with any discoloration of the skin and encourage better blood flow are all huge parts of its formula, so it definitely sounds promising. I’ve even read somewhere that it can aid in the most severe cases and whilst mine most definitely is not, I thought that could be a bit of a break-through for any of you that do suffer quite badly. It contains “Renovage” which has shown a reduction in Rosacea symptoms in up to 90% of patients in testing. Probably one of the best things I’ve come across so far is that it actually works against your triggers. This is a bit of a breakthrough for me. I always try to wear sunscreen, avoid stressful situations and stay energized, but sometimes things can go out of hand. To know that Skinception Rosacea Relief Serum will be working with me, not against me as I swear sometimes Rosacea is, is a huge relief. For me, it has only done wonders for my skin condition and no side effects so far. It’s said to work as a protective wall for your skin so that these factors don’t affect us so much as constantly spin us into that well known Rosacea cycle. I think I also love the fact that the anti-ageing side of things aims to work against inflammation and stop any long terms damage setting in. This definitely sounds like a wonder product to me. The good thing is that luckily, The Skinception Rosacea Serum has only benefited my skin and if for some reason it doesn’t work for you-you have the option of getting a refund in 90 days! So, pretty much straight away after finding out about Skinception Rosacea Relief Serum I got my hands on some. I wasn’t going to let this opportunity slide. I started off by using it after cleansing at night and then again in the morning before applying makeup. It has a really nice consistency to it and feels light on the skin which is great for me because I hate nothing more than feeling like I’m clogged with products. Also, it doesn’t make your skin oily which can result in your makeup sliding off of your skin. I also noticed that it absorbs so easily which is always a great start and I didn’t have any reactions. This can be so very important as I’ve noticed that my skin has gotten a little more sensitive with age and tends to get ticked off a lot easier. After using Skinception Rosacea Relief Serum for a couple of weeks now, I can definitely say that my face feels calmer. My skin has less texture and more smoother. Combining it with trying to keep my triggers at bay, I feel like red overall and I’m starting to think that Rosacea Relief Serum doing me some good. And while I’m not completely flawless when it comes to my complexion, I’d definitely admit that Skinception Rosacea Relief Serum is doing something great. I think the barriers are really getting to work and helping me keep Rosacea at bay once and for all! Skinception Rosacea Relief Serum is definitely going into my “must have” list of products!